The Billy Graham Evangelistic Association produced a documentary about the life of Billy Graham, who passed away on February 21 of this year. “Billy Graham: an Extraordinary Journey” tells how God used Billy Graham to reach millions of people with the gospel. This 72-minute documentary is available as a free digital download through December 31, 2018. The BGEA encouraged churches to show the documentary to inspire members to reach your community with the Good News of Jesus Christ. Go to BillyGraham.org/film. Participants in the dedication service prior to the start of construction. Rev. Kin Keung Yiu, superintendent of Hong Kong Conference, is near the middle in the blue shirt. Missionaries Brian and Rachel Glunt and Milton and Erika Pacheco are on his left. 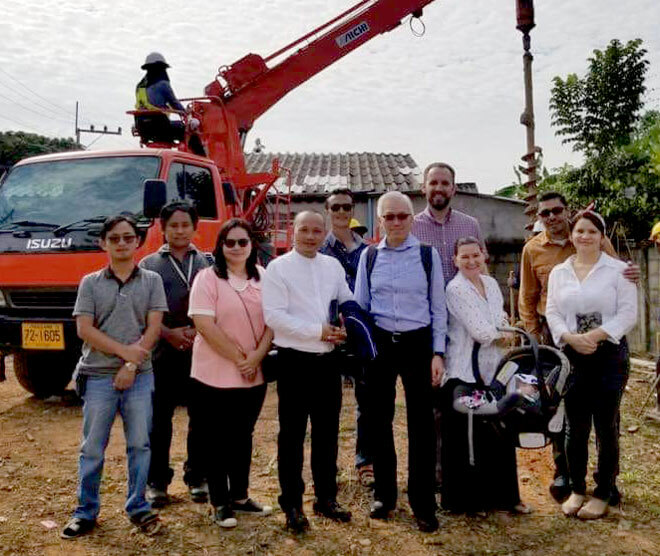 November 1 was a big day for our missionaries in Thailand–the groundbreaking for the United Brethren Community Center in Chiang Rai. Rev. Kin Keung Yiu, superintendent of Hong Kong Conference, and Rev. 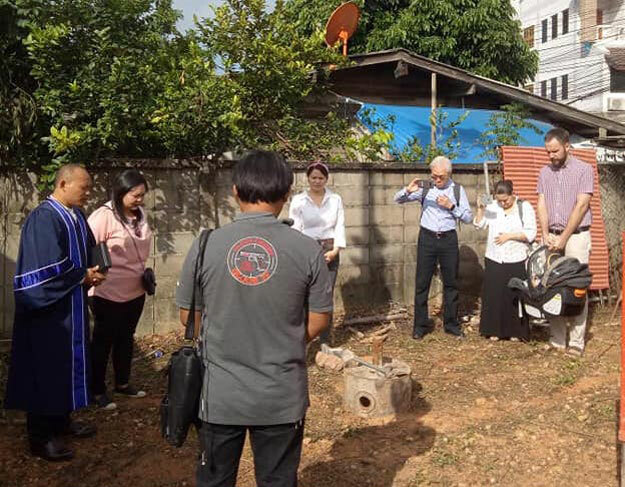 Ajarn Adisorn, a pastor in Thailand, joined our missionary team in presiding over a service of dedication and prayer for the safety of the workers. And then, just like that, they got started. The original building was purchased jointly by Hong Kong Conference and UB Global. The plan was to renovate it into a community center, but there were problematic issues. It was deemed better to just tear it down and build something new. So that is what’s happening. Each year, the United Brethren Year in Review is published during January. 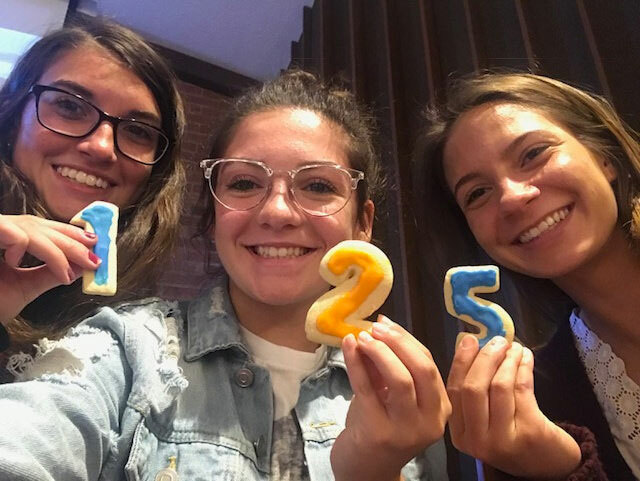 It takes a look at everything that happened during the previous year in the United Brethren world–in missions, in local churches, at Huntington University, at denominational events, etc. This 8-page publication is mailed around the end of January for distribution in UB churches. Or, you can use the form below. If you have photos, that would be great. The Pastoral Ministry Licensing Team (PMLT) has been busy this year approving and granting ministerial licenses to United Brethren people. Here are 17 new licensees from 2018. L-r: Brad North, Philip Kandeh, Jerald Jones, Dan Reed, Curtis Carnes, Matt McKeown, and Josh McKeown. Brad North, appointed in April 2018 as senior pastor of South Scipio UB church (Harlan, Ind.). Philip Kandeh, from Mt. Zion United African Church (Philadelphia, Pa.). Jerald Jones, appointed in March 2018 as senior pastor of McCallum UB church (Delton, Mich.). Dan Reed, Family Pastor since August 2016 at Bethel UB church (Elmore, Ohio). Curtis Carnes, Pastor of Missional Discipleship at Renew Communities (Berea, Ohio). Matt McKeown, associate pastor of First UB (Holly Hill, Fla.). Josh McKeown, appointed in August 2017 as senior pastor of Faith UB (Port Orange, Fla.). L-r: Don Swartz, Nik Walborn, and Brandon Groff. Don Swartz, Executive Pastor at Dillman UB church (Warren, Ind.). Nik Walborn, Student Ministries pastor at New Hope Community Church (Bryan, Ohio). Brandon Groff, Student Ministry Pastor at Fowlerville UB church (Fowlerville, Mich.). L-r: Nicholas Balsiger, Andrew Franks, Eric Griffon, Adam Keath, Lissa Litka, Julie Llewellyn, and Jason Peterson. Nickolas Balsiger, Associate Pastor of Discipleship & Student Ministries /Youth at The Well (Huntington, Ind.). Adam Keath, Director of Restoration and Recovery at King Street UB church (Chambersburg, Pa.). Lissa Litka, Spiritual Journey Director at Morning Star Church (Kokomo, Ind.). Julie Llewellyn, Pastor of Early Childhood Ministries at Emmanuel Community Church (Fort Wayne, Ind.). Jason Peterson, Children/Youth Pastor at Atlantic Avenue UB church (Franklin, Pa.). UB Connected Projects from UB Global on Vimeo. Jeff Bleijerveld, executive director of UB Global, will be among the speakers. The above video describes some of the activities of UB Connected churches in regards to United Brethren mission work. We now have a United Brethren presence in France. Numbers vary, but most agree that there are approximately 58,000 Haitians and French of Haitian descent living in France today. The vast majority of these reside in the Greater Paris area. Pastor Oliam Richard, our current national leader in Haiti, immigrated to France with his family in 1983. He planted the L’Eglise de Dieu Primitive in Alfortville (20 km south of Paris). 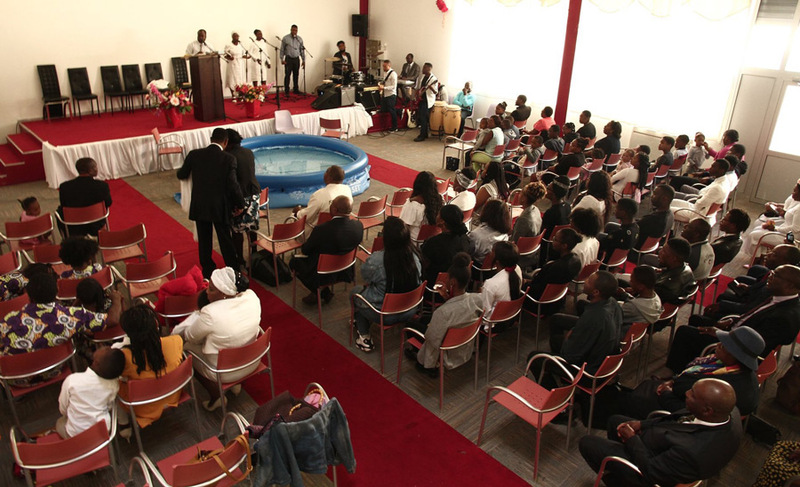 The church meets in a rented location that seats about 200 people. Nearly 50% of attendees are children or young adults. 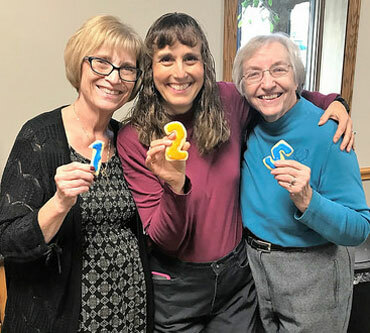 For some time, there has been discussion regarding the possibility of receiving this congregation into the fellowship of the United Brethren in Christ. 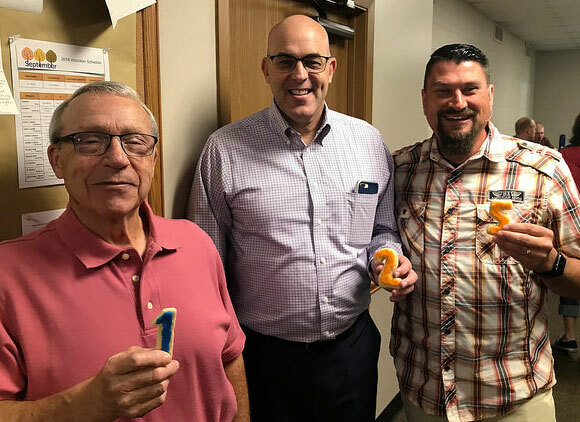 So on the occasion of the church’s 35th anniversary, Jeff Bleijerveld, UB Global Executive Director, joined by Pastor Richard, met with the leadership and congregation to officially welcome them into the United Brethren in Christ. Over the weekend, the church baptized six young adults (4 men, 2 women), and multiple gatherings took place. During the official anniversary celebration, over 200 people crowded into the building, with another 100 listening from the street outside. Jeff had the opportunity to share with them our UB priorities, namely, Gospel, Unity and Mission. He was pleased to be introduced to another independent Haitian church in a neighboring town which is also interested in becoming United Brethren. Both churches are looking for ways to engage immigrants, whether Haitian or not, as well as the French citizenry, which consists increasingly of Agnostics or Muslims. 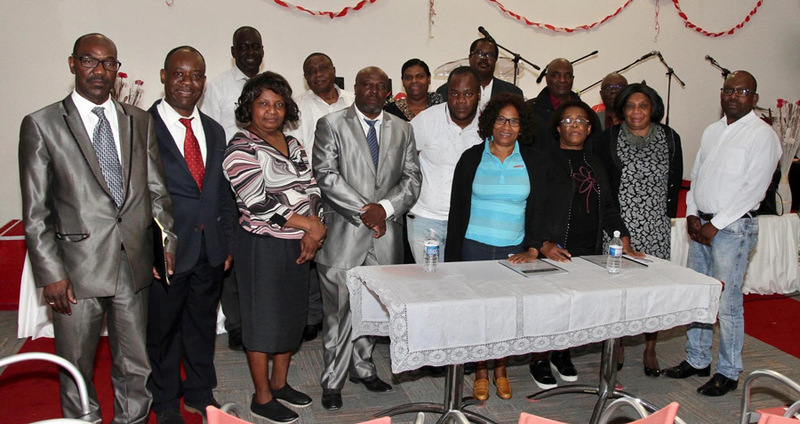 They believe there is opportunity to multiply disciples and churches in France. At this time, France is a mission district of UB Global, with strong relational ties to their sister churches in Haiti.